Hello happy readers. I hope you all are having a good week, mine is so close to being back on a regular schedule again. It's such a pain from knowing your schedule for the year set days then you have 2 weeks where you have to look at the schedule every day to remember what day it is and if you have to work. Not cool. But onto more important and much for fun things, Aprils book of the month with Perpetual YA Bookworms was The Queen's Rising (The Queen's Rising #1) by Rebecca Ross. My thoughts on the book in the different sections can be found in spoilery detail on the discussion board. In May we have 2 books A Court of Frost & Starlight (ACOTAR #3.1) by Sarah J. Maas which I already finished and reviewed here, and Renegades (Renegades #1) by Marissa Meyer which I hope everyone will join us for! 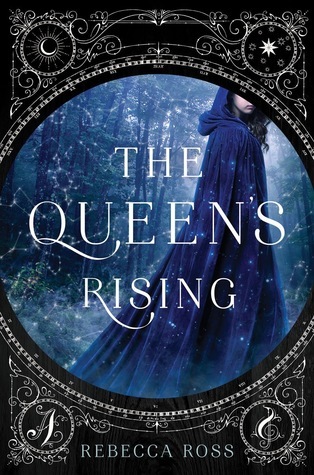 But onto my review of The Queen's Rising. So first off this cover when I first saw it made me want a cloak all the more. Yes if and when my bestie finally makes us those cloaks she's been talking about making us for YEARS I will totally be the one rocking a cloak like a boss. We follow Brienna who is put into the Magnalia House to master one of the passions: art, music, dramatics, wit, or knowledge, and in the end gain her cloak and a patron I was ready. I was a good student but I think a cloak would have motivated me more than a piece of paper…I'm just saying. Struggling to find her place she chose to study knowledge much later than she many others and when her seventeenth summer solstice comes she finds herself without a patron. Still things are not over for her as she discovers something different about herself aside from being of both Velenia and Maevana. Brienna ends up taking many risks as she takes on an unexpected and unorthodox patron as she fights to restore the rightful queen to the Maevana throne. War is building and sides are drawn as Brienna uses the gifts she was given and must choose her own side. So right off the back we have the mystery of her parentage not knowing who her father is just that he is Maevana. The rules are bent in order to allow her, a sixth girl into the program despite her not having an initial talent. Brienna goes from passion to passion not finding her place right away like the others but they are all so supportive and really a great sisterly pack. I do hope we get to see more of Ciri, Oriana, Abree, Sibylle, and Merei as the series continues on. They were a nice part of the first part of the book and I loved their interactions as they worked with one another. Honestly I think Brienna is the most unique not just by her parentage but because she has spent time with each passion she is a fuller individual for it drawing on a small thing learned from each one. She wouldn't master them but she took something from each and I love that. Then of course in Magnalia we have to talk about her Master of knowledge Cartier. I enjoyed watching him build her up and encourage her. Things get much more interesting as the world continues to grow and build as we leave the Magnalia house and learn about Maevana and how some plot to take the kingdom back and put it back into the hands of the rightful queen as a king was never meant to rule. I loved this aspect. The uprising and espionage here but also that it is a woman's land to rule. They are trying to find the two pieces they need to make their stand and Brienna is the key to finding one of them. She begins to learn more about Maevana history and customs, learning the other half of herself. I like the balance between the two, again making her a beautiful balance. I also like that she is fighting to help the rightful queen, she is just a cog in the wheel rather than the main part which is different from most fantasy I have read as of late. So that was neat. "If you offend a Valenian, you lose your reputation. But if you offend a Maevan…then you lose your head." There is a really slow build romance happening that while I wanted more it wasn't the primary focus as higher priorities took president but it was still there in the background just simmering to a boil. It was done with great care. The world building really went all out. I was enjoying all the different locations greatly as we dove deeper into things. This is a beautiful world made more beautiful by the writing. I look forward to seeing more in the world even though I could say this title could have easily been a stand-alone I am curious to see what more will happen. This was an amazing book and even more amazing debut!